Research papers on Jesus' public ministry are written by theology writers with a background in the history within the Gospels of the Bible. Custom written and always on your exact topic, research papers on any aspect of Jesus' ministry are available for you. He was known as a miracle worker. At least in Mark’s gospel, Anderson writes, he never even thinks of going to Jerusalem until the very last week of his life. This is different from John’s gospel that has Jesus in Jerusalem from a very early state. In Nazareth, Jesus’ own people and community rejected him and his teaching. The gospels report him saying the now well-known sentiment: “A prophet is not without honor, except in his own country, and among his own kin, and in his own house” (Mark 6.1-6). Jesus found a more receptive audience in Capernaum, on the coast of the Sea of Galilee. There he called his first disciples. There is evidence, Sanders writes, from the earliest days of the church that Jesus’ followers expected to be supported by others while they conducted their mission. As Jesus and his followers moved from village to village, they found one or more individuals willing to provide a meal and simple lodging. According to Luke, they had ample means of support: while Jesus and the Twelve went through Galilee, they were accompanied by women, including Mary Magdalene, who had seven devils cast out by Jesus, and Joanna, Susanna, and many others (Luke 8.1-3). It seems, then, that we can accept Luke’s statement as generally probable: Jesus and the others were partly supported by prosperous women, some of whom also followed him. Parables of Jesus Christ - Parables of Jesus Christ research papers illustrate that in the teachings of Jesus, he made use of parables to show lessons. The Passion of the Christ - The controversial film The Passion of the Christ, released in early 2004, garnered both acclaim and censure from critical and popular audiences. 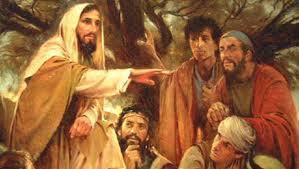 History of Jesus - Jesus Christ, as a religious leader, served one purpose during his lifetime. Second Coming of Christ - The Second Coming of Christ is a widely and differentially interpreted topic, but essentially refers to the return of Jesus Christ to earth. Ethics in the Early Church - Clearly, the exemplar of Jesus Christ must necessarily serve as the most important ethical model for believers. Jesus Was Not A Philosopher - Jesus Was Not A Philosopher research papers illustrate that the Christian Church and Christianity do not consider Jesus Christ a philosopher. The Lord's Supper - The Lord's Supper research papers look at reformed theology's meaning of the sacrament instituted by Christ at the Passover meal. Paper Masters writes custom research papers on Jesus' Public Ministry and tell the history of Jesus Christ and his teachings according to the Gospels.